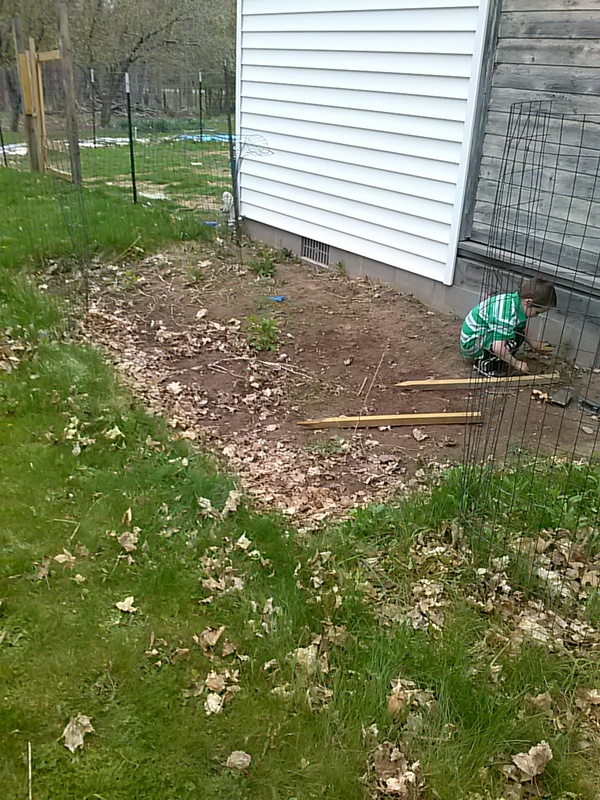 I’m working on getting the garden beds ready for this year’s plantings. Tonight after work, I wanted to start working on my old garden bed from last year, which is at the back of our house. I’ve been eying it lately, realizing I’d have some work to do to get it ready. My parents used it for several years, and then we planted in it last year, so the soil is ok, but not wonderful. I dug it a little bigger last year – it’s now about 25×6′ in most of the garden – there is a spot that is still grassy that I will tackle in the next few days. The part closest to the house is very sandy, and as you get further away it’s very clay soil with lots of rocks. I added some amendments last year – newer soil, some leaves, grass clippings, but it will probably take a few years of amending it to get it really nice. Here’s what the back garden bed looked like before we started on it tonight. It was pretty dry here the last few weeks, so the soil was very compacted. We got some good rain the last couple of days so I thought tonight would be a good night to try to till it, because it would be softer – I do not have a rototiller that works, so I have to do it by hand. 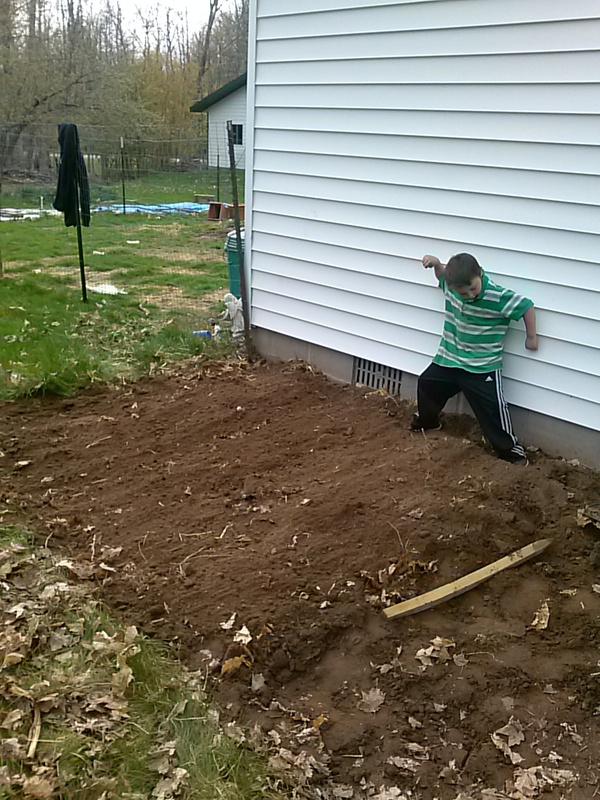 With my trusty helper (my son Daniel) by my side, we chopped up some of the top layer of soil. My plan was to pull the weeds that were setting up in there, move the top few inches of soil, and bury some compost into it. Our compost isn’t fully composted yet, but I have a good mix of old chicken bedding/poop and leaves sitting on the compost pile that I decided to use. Working in sections, I would move the soil we’d broken up and dump in a wheel barrow full of compost material, and then bury it. I also tried to move the sand/clay portions of dirt around so it’s more mixed together. Here is the finished section we did tonight – there’s still quite a bit of work to do since we only had time for about a 6-8 foot section tonight, but it goes pretty fast once you get the dirt broken up. It’s a lot of shoveling. I think the bed will work nicely though. I have some Kale seedlings that I need to get planted soon. A section of the back garden that we finished layering compost material into.